Above the inscription at the front of the monument, there is a metal armorial achievement mounted to the pedestal. The achievement consists of the shield, the helm, and a crest (a stag with an ear of wheat – the abundance of wheat here and in the shield may well be a reference to the family name, Grainger) -, and the motto scroll. The shield in itself is rather complex. It is divided into a dexter and a sinister, the latter of which is subdivided further. The dexter exhibits three ears of wheat, stalked and leaved, two over one. The sinister consists of four quarters. 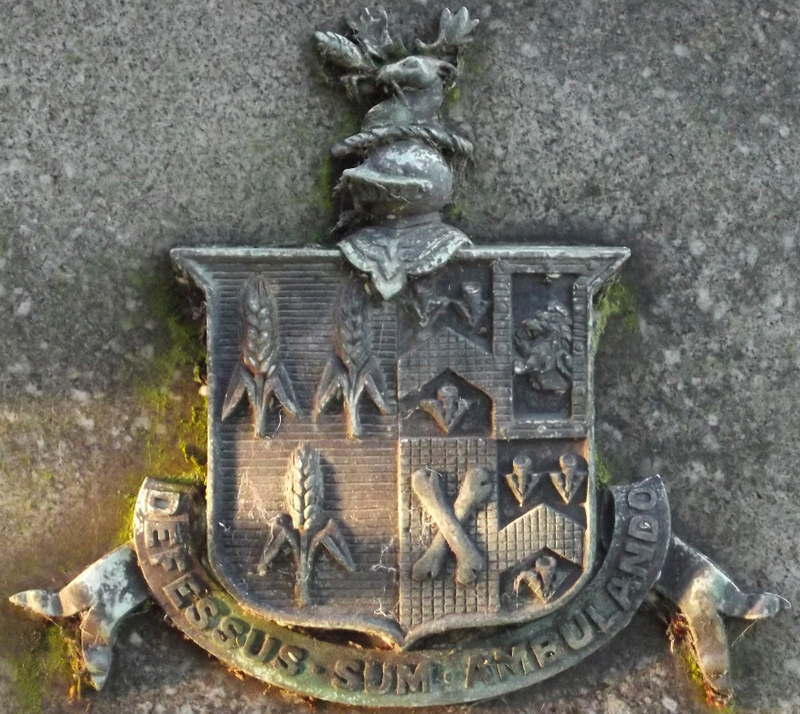 The upper left and bottom right quarters display the same charges, namely a chevron between three pheons (a reference to the Smart of Trewhitt family, mentioned in the inscription on the back of the monument), two human shinbones in saltire in the bottom left quarter, and a demi-lion rampant in the top right quarter. Considering the genre – a motto scroll -, the text conveys an unusual, in fact rather remarkable level of resignation (not least for a parish priest, mind). Why such a seemingly dispiriting motto then, one must wonder? The answer is somewhat surprising: to the knowing, the motto is not actually dispiriting at all. It is a verbatim reference to the play Adelphoe (‘The Brothers’) of the Roman second-century B. C. playwright Terence, where Demea, an old(er) man and country-dweller, had been sent on a wild goose chase throughout the entire town, by the slave Syrus, when trying to find his brother Micio. certum obsidere est usque donec redierit. 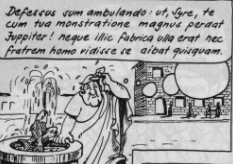 In keeping with the comic genre, as soon Demea gives, of course, he finally gets to see Micio, who had been in the house all along (and who enters the stage just after Demea has finished his last line). ‘Seek, and ye shall find,’ they say – but a possible lesson from the scene above is: you cannot trust the directions given to you: go to the most likely place and pause, and what you are looking for will come to you. This may be the true idea behind the motto of John Cecil Grainger’s arms, then: not resignation, but the deeper lesson that the suspension of restless activity and planless business may in fact be the better way to achieving one’s aims. This entry was posted in Epigraphy, History of Reading, Poetry and tagged Big questions, History of Reading, Latin Inscriptions, Terence. Bookmark the permalink.